Summer is just round the corner and that means it’s almost time for relaxing, unwinding and enjoying the outdoors. Anyone who’s ever used a hot tub knows just how amazing it can be. There’s nothing better than slipping into a hot tub after a long hard day to relax your body and refocus your mind. Unfortunately for most of us we just can’t afford a traditional hot tub. The initial cost plus any set up costs immediately make it an unattainable dream that’s always out of reach. Well not anymore! A new material has been developed which is flexible, but durable enough to store thousands of litres of water. This has allowed for the creation of the inflatable hot tub which offers the same benefits of a traditional hot tub, but without the huge price tag or other cumbersome elements. So if you haven’t heard of them before it’s time to get excited because inflatable hot tubs are taking the world by storm. Let’s take you through what they are and where to find them. What is an inflatable hot tub? Ok, so it’s an obvious question but still worth answering. As you may have imagined an inflatable hot tub is the same shape and size of a normal hot tub, but it’s filled with air rather than a fixed structure. Imagine a giant, adult paddling pool that’s bigger and with way more functionality (and of course it’s warm). A standard hot tub comes with two elements: a pump and a heater. Once you plug in the electric pump the inflatable hot tub will go up quickly, and then stay topped up with air. The inflatable hot tub can then be filled from a hose and doesn’t need to be fitted to your plumbing like a traditional hot tub. Once filled you can turn the heating unit on which will get the water to the right temperature. An inflatable hot tub uses fans to circulate the warm water, keeping it at the requested temperature while it’s turned on. Then massage jets will create the same effect as you would expect from a traditional tub. The essence of an inflatable hot tub remains the same as a traditional hot tub. However an inflatable hot tub has a range of benefits that are making it quickly more popular than its counterpart. Why go for an inflatable hot tub? Traditionally hot tubs have been reserved for those with plenty of money to spare as they carry price tags in the thousands. Inflatable hot tubs are much more affordable, with models for a fraction of the price. Not only is the initial cost less, but you don’t have to pay for the professional fitting which saves you a lot in set up costs. If you like in a part of the world where good weather comes and goes in an instant you don’t want to have to wait. You also don’t have to have a permanent fixture taking up half your garden. Inflatable hot tubs are quick to set up and take down, letting you make the most of the available space. An added benefit of the inflatable hot tub is the portability. When deflated it’s easy to carry and transport the hot tub so you can take it with you on holiday or to a friends house when needed. All in all inflatable hot tubs are simple. They allow you to keep control of the process and set up exactly what you want. It’s the benefits of a hot tub without all the hassle, what’s not to love!? Inflatable hot tubs are pretty awesome however you look at it. They’ve got a lot of benefits that traditional hot tubs don’t have, with very little downside. In fact the biggest difficulty you might face is which inflatable hot tub to choose. An obvious factor, but one that shouldn’t be overlooked, is the maximum capacity. A standard hot tub will fit 2-4 people and that will be fine for most but if you have a large family then you might want to opt for a 4-6 person tub. Obviously when looking you should expect to pay slightly more for a larger hot tub. A key component of any hot tub is the massage it can offer you. A series of jets built into the device will force water in certain directions and help massage your aching muscles. This is crucial for relaxation so make sure you’ve had a good look round. Again, this might seem standard but it is always worth checking. Generally hot tubs will heat water between 35-45 degrees celsius, but in our opinion anything less than 40 degrees won’t give you the hot tub experience you’re expecting. 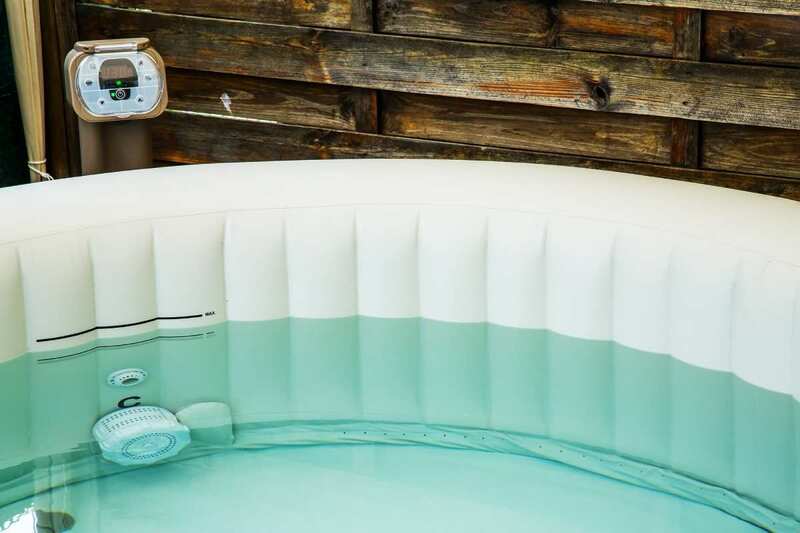 Rex Garden have compiled a list of the best inflatable hot tubs on the market with a detailed list of the pros and cons. This can help you see what the best qualities are but also ensure you’re getting the best value for money. Hot tubs have been proven to have health benefits. Regular hot tub use can relieve muscle tension and get rid of stress and anxiety. This means a better focus and more productivity at home and at work. Inflatable hot tubs have changed the game by making relaxation cheap, accessible and guilt free. So whatever your budget, it’s time to upgrade your home with an inflatable hot tub and make the most of your free time.